Become a Volunteer | Brand Ambassador for Girls Are Powerful! 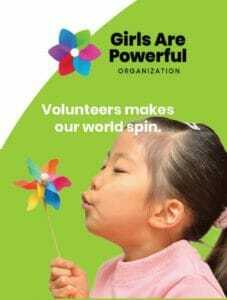 Thank you for your interest in volunteering with Girls Are Powerful (GRP)! Volunteers are a respected and valuable resource to Girls Are Powerful. Brand Ambassadors add extra significance by sharing their talents and time with the people who attend our events and workshops and to those who are not familiar with GRP. They also create an impact in the lives of young girls. Whether you can help as a Board Member, with day to day operations, or with website content, fundraising, distributing flyers, blog writing, attending events, etc., it all plays an essential role in helping Girls Are Powerful thrive and spread the mission. As a Volunteer / Brand Ambassador, the level of involvement is solely based on the desired commitment level of the volunteer. Bring your passion and expertise to Girls Are Powerful! We need YOU! Please complete our volunteer application below. If you have any questions, please email: brand@girlsarepowerful.org Thank you for your interest and support of Girls Are Powerful! Volunteers are individuals who help facilitate the ongoing success of our organization through a specific role or project-based assignment throughout the year. The level of involvement is solely based on the desired commitment level of the volunteer.